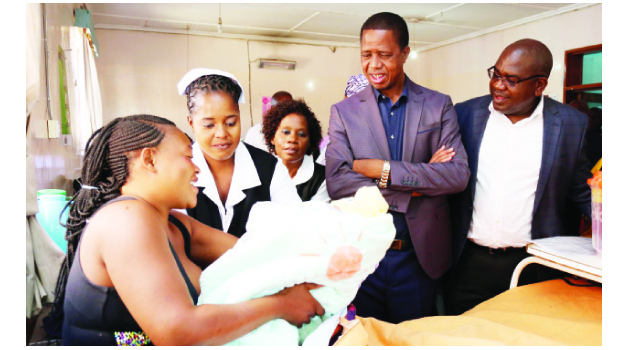 • REBECCA Phiri shows President Edgar Lungu her baby named Favour, one of those born on New Year at Bauleni clinic yesterday. On the President’s left is Health Minister Chitalu Chilufya. The President presented hampers to five New Year babies at the clinic. KABWE town has recorded 13 New Year babies who were born at Mine Hospital, Kabwe General Hospital (KGH), Kasanda Mine Clinic and Bwacha Clinic. But Kabwe Mayor Prince Chileshe was not amused at the behaviour of some fathers to the newly-born babies after noticing that only three fathers of the 13 children visited the health institutions since their wives delivered. The Kabwe mayor expressed his disappointment after donating hampers to the newly-born babies, saying it was imperative that the children received total support from both parents until they were fully grown. Mr Chileshe also took the opportunity to name one of the twins born from Phoeby Chileshe, 23, as Chisupa, one of his traditional names while at KGH he named two of the children as Prince, his first name. The Ndola Teaching Hospital (NTH), meanwhile, recorded seven New Year babies while Chipulukusu and Twapia clinics recorded four, respectively. Ndola Central Member of Parliament Emmanuel Mulenga, in the company of Ndola Mayor Amon Chisenga, presented baby hampers to the seven babies, who born at midnight at NTH. Mr Mulenga urged the mothers to dedicate their children to God and raise them in a way that pleased the Creator. He congratulated the mothers that gave birth on New Year and said that while other women aborted, the mothers in the hospital gave life to the babies. Meanwhile the Northrise Seventh Day Adventist Church donated assorted foodstuff to the mother’s in the gynaecology ward at NTH. .The Muslim community also donated blankets to NTH worth K7,500. 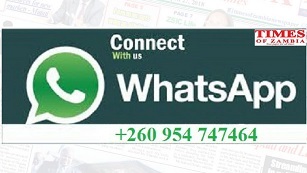 In Livingstone, the Central Hospital recorded two New Year babies, Maramba clinic four and Mahatma Ghandi one. Livingstone Mayor Eugene Mapuwo, who was accompanied by Livingstone City Council members of staff, presented the New Year hampers to the mothers at the three health institutions. Mr Mapuwo urged the mothers to take care of their babies despite the many challenges that they encountered in life. Choma District in Southern Province recorded five New Year babies who were born immediately after midnight. The babies were born at the different health facilities in the district with Choma General Hospital recording two -a boy and a girl, with the first being delivered two minutes after midnight while the second was born 03:00 hours. Macha Hospital in Mbabala Constituency also recorded two, a boy and a girl. Macha Hospital director James DeBoe said the first New Year baby was a girl delivered at 01:22 hours weighing 2.5 Kgs while the second was a boy eighing three kilogrammes and was born at 02:30 hours. Choma Municipal Council (CMC) presented hampers to the mothers of the newly-born babies at Choma General Hospital and Railway Surgery. Choma Mayor Javen Simoloka said festive season was about giving and sharing, hence the presentation of the gifts to the mothers of the newly born babies. Kitwe Teaching Hospital (KTH) has recorded five New Year babies, three girls and two boys. KTH senior medical superintendent Joseph Musowoya said the first born was born around 01:30 hours. Speaking when Kitwe deputy mayor Everisto Chilufya donated baby hampers to the New Year babies, Dr Musowoya thanked the local authority for the gesture.